In 2003 U.C. Berkeley asked me to teach a class in Customer Development at Haas business school. In 2004 I funded IMVU, a startup by Will Harvey and Eric Ries. As a condition of my investment I insisted Will and Eric take my class at Berkeley. Having Eric in the class was the best investment I ever made. Eric’s insight was that traditional product management and Waterfall development should be replaced by Agile Development. While I had said startups were “Searching” for a business model, I had been a bit vague about what exactly a business model looked like. For the last two decades there was no standard definition. That is until Alexander Osterwalder wrote Business Model Generation. Finally we had a definition of what it was startups were searching for. Business model design + customer development + agile development is the process that startups use to search for a business model. It’s called the Lean Startup. 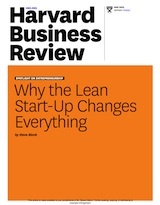 The sum of these parts is now the cover story of the May 2013 Harvard Business Review. 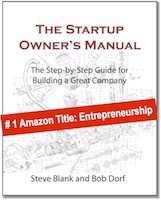 Bob Dorf and I wrote a book, The Startup Owners Manual that put all these pieces together. But then I realized rather than just writing about it, or lecturing on Customer Development, we should have a hands-on experiential class. So my book and Berkeley class turned into the Lean LaunchPad class in the Stanford Engineering school. The class emphasizes experiential learning, a flipped classroom and immediate feedback as a way to engage students with real world entrepreneurship. Then in July 2011, the National Science Foundation read my blog posts on the Lean LaunchPad class. They said scientists had already made a career out of hypotheses testing, and the Lean LaunchPad was simply a scientific method for entrepreneurship. They asked if I could adapt the class to teach scientists who want to commercialize their basic research. The result was the NSF Innovation Corps, my Lean LaunchPad class now taught at 11 major universities to 400 teams/year. ARPA-E joined the program this year, and in the fall we’ll teach a Life Science version of the class at UCSF. And other countries are adopting the class to commercialize their nations scientific output. Hi Steve – Do one in Asia, please. Steve, adoption category 1 and 2 are the same, is it right? Dear Steve, thank you for this post. This is to the point as always. I am teaching entrepreneurship at ESCPEurope, Paris, a business school. We have embraced the idea of teaching ways to search for some time now. Our main course on entrepreneurship is based on 4 projects that the students have to work on. Teaching is on demand and whenever the students need help or someone to reflect their project or learnings with. The course is based on ideas of project based learning, but all four projects are more about finding things out, than executing a business plan or the like. Your posts and blogs are valuable sources for inspiration to create challenges for students, to send them out of the building and make them experience the search. Hi Steve – I’d say that if there are ENT educators out there that are in essence teaching ENT much more effectively because of your and your friends’ lean paradigm shift and development, it doesn’t really matter what camp they fall into or how lean ENT spins off and evolves per the context of the educational setting. The whole point is that millions of startups are now failing less and failing less epicly because of your movement. If I or anyone else teaching Lean ENT change some words or use a different validation board, that doesn’t mean we don’t give you credit. I know I do. Love your lean brothers and sisters: They will not always be just like you and that should inspire curiosity, not labeling. Thank you for sharing all the resources! Excited to see the impact this will make on both the startup world and big, established companies, who will (hopefully) start catching up at some point. We’re running the first Lean Launchpad (as I-Corps version is) experience in a Spanish University!! Zaragoza University > http://www.unizar.es/spinup (The web content is only in Spanish, for the time being. You are mentioned, of course). We’re starting on September. We’re really excited. Thank you very much for your generosity giving all the materials, logistics, tools and so on for free. Any advise, experience, extra material, etc… They will be really welcome!! We’ll buy at least 16 copies of The Startup Owner’s Manual. Thank you again. You, Bob, Jerry and all the people around the Lean Launchpad are the very best of the global entrepreneur community. Any cost details for the incubator and accelerator version Steve? I’m a member of The Innovation Warehouse in the UK and would love to bring a small team to the event and contribute to a program of events here to immerse the local startups and other members in the experiential learning and build on the local startup community. 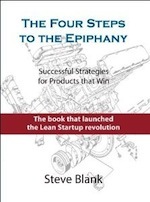 is my view of the Lean Start-Up. If you are a startup, I highly recommend the Udacity – How To Build a Startup Course. licence such as one of the Creative Commons licences, so someone can re-purpose/translate the content while giving you attribution? Sorry if I’ve missed/ not seen the license info. Hey steve, thanks for the guide! I cant find it anymore. What happend?